Get Free Bear Safety Packet with Bear Safety Sticker for Kids. Just click on the link on their site then fill out the form with your information and they'll get it mailed out to you. 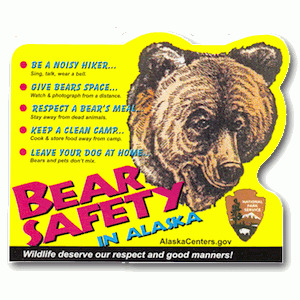 Bear safety is very important if you plan out doing any outdoor exploring in Alaska. The National Park Service wants to help remind kids & adults to be safe and aware in nature so they are offering a FREE Bear Safety Packet which includes a Bear Safety Sticker.